It’s no secret that digital audio takes up an ever-growing share of listening time. What’s more surprising is the speed at which this change is taking place. A recent study by Adobe estimates nearly half of U.S. homes will own a smart speaker by the end of the year with 70% of those speakers used for traditional radio functions like music, news, and sports. This creates challenges for audio content companies that are selling and valuing their audiences in different ways on different platforms. The TV world has made it a top priority to address the challenge of fragmented audiences and their changing behavior, and some major media companies have taken the radical step of collaborating on new audience measurement standards to help them sell impressions fluidly across distribution platforms. The OpenAP initiative and NBCUniversal’s CFlight are notable emerging network-led initiatives for documenting the total size and value of audiences across viewing platforms. Despite the onrush of smart speakers and mobile streaming in the audio world, content providers have been slower to adopt methods for packaging and selling impressions holistically across their linear, live streaming, and on-demand platforms. Whether audio content is consumed on a smart speaker or a radio, the audience experience remains basically the same. Even so, many media companies still think about their airwaves and digital access points as separate products. 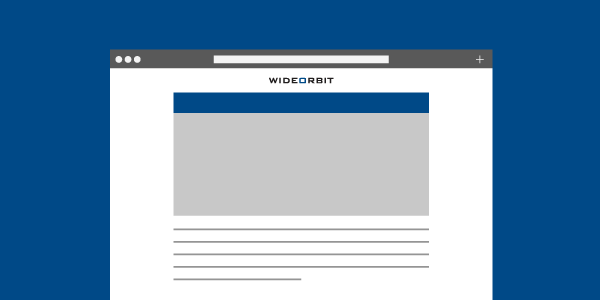 Last week, WideOrbit Senior Director of Product Management Jim Kott led a webinar aimed at helping audio content providers think more holistically about their audiences and advertising. In the spirit of preserving the value of linear assets, we’re now making it available for on-demand viewing. Learn more by watching the webinar or downloading the PowerPoint.